New Delhi, Jan 31: Vice-President and Rajya Sabha Chairman M Venkaiah Naidu today urged political parties not to stall proceedings for political reasons. 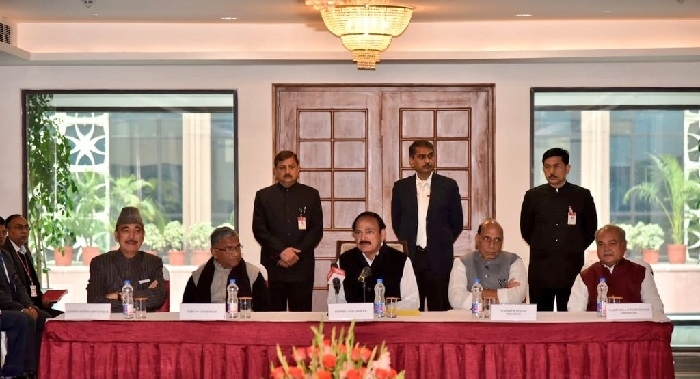 Addressing the all-party meeting on the first day of the budget session, Naidu sought co-operation from all the members for the smooth functioning of the upper house. Underlining the importance of discussions and deliberations, Naidu hoped that Rajya Sabha members would set an example before the nation. The Rajya Sabha Chairman informed that discussion on the thanksgiving motion would be the prime agenda for the upper house. Begun on Thursday, this will be the last budget Session before the 2019 general election. The session will conclude on February 13. On this occasion, RS Deputy Chairman Harivansh Narayan, Union Minister Rajnath Singh, Parliamentary Affairs Minister Narendra Singh, Leader of Opposition Ghulam Nabi Azad and leader of various parties were present.